of new crimes and new solutions." INSPIRED BY A REAL UNSOLVED CRIME! 1946: A group of criminals pulls off the heist of the century, stealing a dozen priceless works of art from a Boston museum. Some of the thieves are captured, some are killed—but the loot is never found. Forty years later, a college student finds himself on the trail of the missing art—and the multi-million-dollar reward. But three decades after that, the art is still missing, and as his classmates return to Boston’s notorious Charlesgate Hotel for their big 25th reunion, dead bodies keep turning up. Will the stolen masterpieces be discovered at last? A breathtakingly clever, twist-filled narrative that moves from 1946 to 1986 to 2014 and back again—and is steeped in Boston lore, including three unforgettable seasons of Red Sox baseball—CHARLESGATE CONFIDENTIAL establishes Scott Von Doviak as a storyteller of the first order, and will leave you guessing until the final page. "Charlesgate Confidential is a riveting tale, a hard-boiled art heist worthy of Dashiell Hammett in his prime." "Charlesgate Confidential is the sort of canny, witty crime novel that doesn’t come along often enough. Scott Von Doviak is terrific at Boston voices and a fearless plotter. The crew at Hard Case Crime has found another gem! May they never reform." 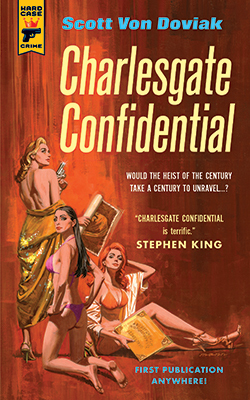 "Charlesgate Confidential is a corker! With its intriguing plot, witty repartee, and an amazing sense of place and time, it had me reading way past my bedtime. Can’t imagine it not making the Best Of lists next year."